May 11th – around Stanton Moor in the Peak District. 10.00am to 5.00pm. May 25th – flower meadows and landscapes in the White Peak. 10.00am to 5.00pm. June 22nd – Lathkill Dale in the Peak District. 10.00am to 5.00pm. All of these intermediate level courses will be limited to just 4 people. Places cost £85.00 per person (not including lunch) – click here to request a booking form for our landscape photography courses, or if you need any further information. See here for details of all our other digital photography courses in the Derbyshire Peak District. If these dates are not convenient for you due to other commitments, why not consider some one to one photography training at a place and time to suit you? 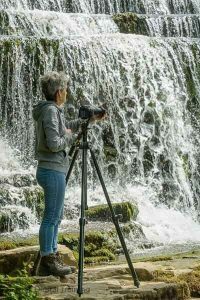 Our landscape courses are most suitable for owners of digital slr, mirrorless or any type of camera that has interchangeable lenses – whether it is Nikon, Canon, Sony, Pentax, Panasonic, Olympus, Fuji, Samsung or any other make. A tripod is essential, but we have several for loan if you don’t already have one, and we also have a selection of filters (neutral density, graduated neutral density and polarising) that you can borrow as well. As these are intermediate level rather than beginners’ level courses, it is important that you are already familiar with the basics of photography and how to use your camera in other than the “all-automatic” mode. If you are not confident about how to set correct exposure, read histograms, and set the focus point, please see here for details of our beginners’ level digital photography courses which would be more suitable for you. We aim to spend as much time as possible actually taking photos on these courses (rather than walking to locations), so they are not physically demanding and do not usually involve long walks – so should be well within the physical abilities of most people. However, some walking is usually necessary to get to such great locations, so please contact us in advance if you have any mobility or health problems that could be relevant. Below are more details for each individual course. The course on May 11th is timed to coincide with the bluebells being in flower. We ran a very successful course in this location last year, and managed to capture the bluebells at their absolute peak. 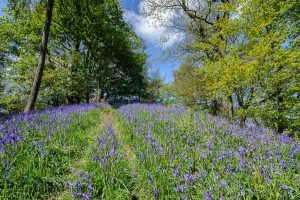 We will spend the morning in the bluebell woods (where there are lots of other wild flowers as well), and then go for lunch at an excellent pub in nearby Birchover, where we can check the morning’s photos on the laptop. In the afternoon, we will go onto Stanton Moor where there are plenty of interesting subjects – including stone circles and other Bronze Age remains as well as quarrying relics. If conditions are suitable, we may be able to get some long exposure cloudscapes with the impressive sandstone outcrops. There will be little walking involved on this course, and what there is will mostly be fairly flat. The course on Saturday May 25th will be a mixture of landscape photography and close up photography of wild flowers. 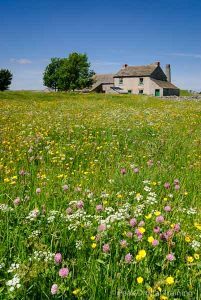 At this time of year, the traditional hay meadows in the Peak District are usually at their best, and we will visit some that can be a truly breathtaking sight that is rarely seen these days. Exactly which location we go to will depend on the weather this spring, but there will be no shortage of other locations looking great as well. These could include disused lead mining remains, an abandoned quarry in a nature reserve, old lime kilns or old water mills. All will provide plenty of good subject matter with interesting textures and colours. Walking will, as usual, be kept to an absolute minimum, and lunch will be in a local pub. On June 22nd, we will be in beautiful Lathkill Dale in the Peak District. This National Nature Reserve is always a very popular location with clients – and spring and early summer are among the best times to see it. There are numerous weirs and waterfalls to practice long exposure techniques with moving water, ruined mine buildings, impressive limestone cliffs, the cave which the river will (hopefully) still be flowing out of and lots of spectacular wildflowers. 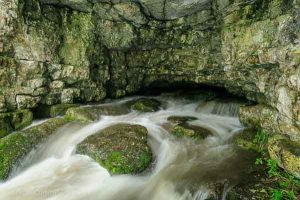 We can also expect to see some good wildlife (including dippers), and there will even be a special surprise with an opportunity to try out some light painting using a torch to light the subject. Not often you get to do that during the daytime! 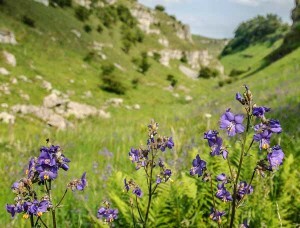 Lathkill Dale is also the best place in Britain to see the rare and beautiful Jacob’s Ladder flower, and some should be in flower at the time of our course on June 22nd as an added bonus. The dale is long and narrow, with few access points, so these courses will involve walking about 4 miles over the course of the day, and you will need to bring a packed lunch as there are no facilities in the dale itself. However, the walking is fairly gentle, and we will be stopping to take photos at regular intervals, so it will not be very demanding.